NC State College of Education hosted 14 foster children for a digital fabrication camp, STEM Explorers, on Saturday, March 24, 2018. 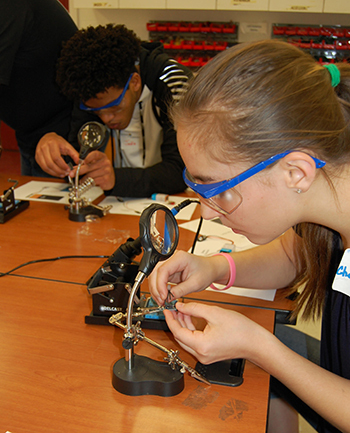 The Technology, Engineering, and Design Education program created this day-long camp to provide free STEM educational programming for students in foster care and other non-parental living situations. 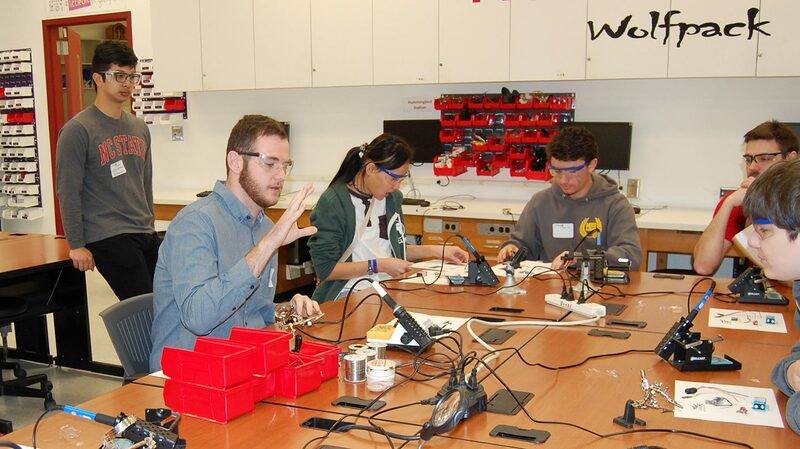 Organized and led by Teaching Assistant Professor Daniel Kelly, Ed.D., the event provided opportunities for children of all ages – preschool to recent high school graduates – to explore both the technological and creative side of problem-solving. Participants designed keychains to print on 3D printers, used a computer-controlled router to create stamps, and used a laser cutter to etch and cut personalized acrylic nameplates. Campers also built, soldered, and programmed computer-controlled electronic lighting systems to illuminate their nameplates. The Technology, Engineering, and Design Education program partnered with the Epsilon Pi Tau International Honor Society for Technology and the non-profit for at-risk youth PUSH Initiative to host this event. Faculty, staff and students from the College of Education served as instructors and support for the camp. Kelly says Cameron Denson, Ph.D., Epsilon Pi Tau chapter trustee and assistant professor, and Daniel Bates, chapter president and Ph.D. candidate in the college’s Learning and Teaching in STEM program, were instrumental to the success of the camp. STEM Explorers began last August with its inaugural week-long camp held on NC State’s Central Campus. Kelly and his team plan to host the next STEM Explorers event this summer.